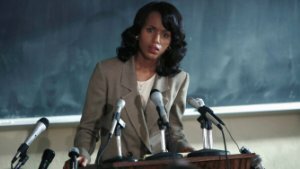 "Starring Kerry Washington, Wendell Pierce and Greg Kinnear, Confirmation takes a look behind the curtain of Washington politics, depicting the explosive 1991 Clarence Thomas Supreme Court nomination hearings where Anita Hill accused him of sexual harassment. The hearings brought the country to a standstill and became a pivotal moment in American culture forever changing how we perceive and experience workplace equality and gender politics." FYI, those "Buy at Amazon" and "Watch via Amazon" links shown in the Movie Info block go to a different movie that is not this one. I find it fascinating that two of the most recent and interesting forms of media that tackle tough subjects: racism, sexism, power, politics, gender, corruption, abuse, violence... were both stories that looked backwards, The People v. O.J. Simpson: American Crime Story, and now Confirmation. This is the kind of film that makes for good conversation at the dinner table. My favourite scene in the film was when a group of politicians (the few sitting female senators and members of Congress, led by Pat Schroeder) storm the senate and force the Senators to delay the confirmation hearing and investigate the sexual harassment charges that Anita Hill brought to the public and media attention. Kerry Washington is cast absolutely perfectly as Anita Hill. And it makes you think that she's being wasted on Scandal. Why isn't she doing more serious dramatic works? Greg Kinnear also nails it as Joe Biden. A goosebumps kind of performance that had me doing a double take the first time he flashed on screen. Definitely worth watching.